We are pleased that the DPAC research team’s submission to the Work and Pensions Committee has been accepted and published. We especially want to thank Anita Bellows and Bob Ellard for all their hard work on this. Great to see submissions from our sister organisation Black Triangle, our allies, Inclusion London, WoW, Nick and Carer Watch. We are disappointed that no formal national organisation of disabled people claiming to be run and organised by disabled people based in England appears to have submitted any text on this important issue. You need to scroll down the page. 2. This submission contains a number of areas of ESA and WCA that we believe demonstrate why the ESA system is fundamentally flawed both in concept and implementation and should be scrapped with immediate effect. 4. The WCA descriptors are the criteria used to assess whether a claimant has limited capability for work, in other words whether a claimant falls within the eligibility criteria for claiming ESA, or not. 5. The descriptors define a set of functions related to work tasks, which, if the claimant can perform to an adequate standard, the claimant is considered able to perform some paid work and therefore not eligible to receive the ESA Benefit. 6. However we believe that the criteria for ESA eligibility are disingenuous. They take into account only functional ability, NOT the ability to hold down a job in practical terms. · Is the claimant able to travel a reasonable distance to and from a job, consistently, every day. 8. Nor does it consider what physical discomfort or pain, or emotional or mental pain the claimant may encounter while employed. 9. The WCA does not represent a finding on whether or not the claimant is employable or whether the claimant will be able to find work. 10. While the WCA is commonly called a “fit for work” test, it does not actually test whether a claimant is fit for (ie capable of doing) work. 13. Thus is stands to reason that there are many who will be found ineligible for ESA but not able to meet the practical requirements being able to find and hold down a job and are thus ineligible for both benefits. 14.We do not know how many claimants have found themselves in this position, as the government do not monitor this, and provide no statistics from which we can exptrapolate or estimate a number, but we believe that there will be a significant number of Disabled claimants who fall into this trap and are denied income from either ESA or JSA . 16. While we do not dispute that these Health Care Professionals are qualified and have experience as Nurses, Physiotherapists, Occupational Therapists, etc, we do dispute that this is sufficent to judge a persons’ capability to work, given the panopoly of condition types that any Healthcare professional will be required to assess. 18. In addition it is not uncommon for claimants to simultaneously have multiple condition types such as a mental and physical health condition. 20. ‘Mental health issues are a continuing source of problems in terms of making claims and assessing the impact of mental health issues on disability. In some cases mental health issues were not fully addressed or given due weight’. 21. Following Professor Harrington’s recommendations, DWP accepted to amend the descriptors to better capture mental health issues and to introduce Atos Mental Function Champions in each assessment Centre to ‘spread best practice amongst Atos healthcare professionals in mental, intellectual and cognitive. Although it has led to an increase of claimants with mental health issues being awarded ESA, and especially being placed in the Support Group, the statistics tell a different story. 22. Official DWP figures confirm that in the 2008 quarter from June to August, two months before Employment & Support Allowance was introduced, 153,050 claimants took up a claim for incapacity benefits, around a third of them (56,730) on the grounds of mental and behavioural problems. 23. By the end of the November 2012 quarter, the number of claimants taking up or being transferred on to Employment & Support Allowance had spiralled to 316,950 claims with nearly 140,000 of them (135,990) making a claim on the grounds of mental and behavioural problems – nearly 3 times as many as four years previously, but also representing a higher proportion in the total number of claims (44% against 37%). 24.In the November 2012 quarter, 25,950 of the claimants who took up a claim ESA on mental health grounds had been on the allowance on one or more previous occasions. These figures show a perpetual cycle of claimants and reclaiming, those with mental health problems being by far the most susceptible to making a re-claim. 25. The latest DWP statistics on Employment and Support Allowance published in January 2014 show in Table 7 the Outcomes at initial functional assessment split into International Classification of Diseases. 26. The total number of ESA claimants is 834,500 (WRAG 467,400 + SG 367,100), of which 339,200 (WRAG 193,100 + SG 146,100) of them fall under the Category ‘Mental and behavioural disorders’. It means that this group of claimants accounts for 40% of all illnesses, but because 193,100 (57%) have been placed in the WRAG, proportionally, this group is already more exposed to sanctions than any other groups. 27. A recent response to a FOI request confirms that claimants with mental health issues are not only sanctioned disproportionally, but also exposed twice to more sanctions and hit harder than any other groups. 28.Even before the introduction of the stricter sanction regime, there were already a higher number of claimants with mental health issues being sanctioned. But the latest figures disclosed show that 5,940 claimants with mental health issues were sanctioned out of 10,210 ESA sanctioned claimants (58%) in 2013. 29. The figure in 2012 was 54% when these claimants only account for 40% of all illnesses. 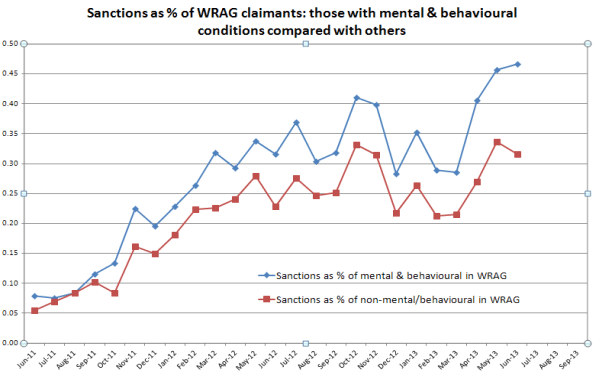 Since October 2011, on average the rate of sanctions for claimants with mental and behavioural conditions has been exactly one third (33%) higher than for other claimants, as the graph shows. 31. ‘Bureau experience is that vulnerable clients (e.g. those with mental health problems or minor learning difficulties) are disproportionately sanctioned.’ (http://www.citizensadvice.org.uk/citizens_advice_bureaux_foodbank_survey) but which is now confirmed by DWP statistics. 32. This has to be seen in the context of the number of people with mental health issues placed onto the Work Programme. The latest Work Programme statistics (20th March 2014) show that this group constitutes the majority of ESA claimants on the Work Programme (65%), although as noted previously they account for only 40% of illnesses. 33. Not only are a disproportionate number being placed in the WRAG, but an additional disproportionate number are being put onto the Work Programme, compared with ESA claimants with other illnesses or disabilities. The job outcomes for this group, as shown by the latest statistics, are very poor: only 4,2% of the 131,480 claimants referred to the programme in this group have a job outcome. 34. Not only is the WCA failing people with mental health issues by putting a disproportionate number of them in the WRAG on a shorter prognosis, and a disproportionate number of them onto the Work Programme, resulting in very poor job outcomes, but it also seems that because of the nature of their illnesses, they are the claimants having most difficulty adhering to the conditionality regime, or that they are seen by Job Centre staff as easy targets for sanctions as documented by the CAB, leading to a disproportionate number of them being sanctioned when compared to other ESA claimants. 35. Ultimately, they would be the very people whose health is likely to worsen as a result of the failings of the WCA and of the consequences of having been put into the WRAG. 36. The latest figures published by Her Majesties’ Courts & Tribunals Service in March 2014 show a dramatic reduction in the number of Social Security & Child Support appeals lodged directly with Tribunals. This is the result of the introduction of ‘Mandatory Reconsiderations’ which is a DWP internal dispute resolution process, aimed at reducing the number of appeals directly lodged with Tribunals. 37. These Mandatory Reconsiderations have had a substantial effect on the number of appeals lodged against an ESA decision. Only 32,969 ESA appeals were received between October and December 2013 compared with 111,817 in the first quarter of 2013/2014 and 76,456 in the second quarter. 38. The number of ESA appeals ‘cleared at hearings’ in the third quarter of 2013/14 has significantly increased with 83,202 being heard, of which 45% were in the claimant’s favour. This is the highest success rate for claimants ever recorded. This compares with 58,276 in the same quarter of 2012/2013 when the success rate was 42%. The overall number of cleared ESA Tribunal hearings in 2012/2013 was 224,375 with an average success rate of 43%. 39. The drastic reduction in the number of appeals lodged directly with Tribunals makes it even more urgent for the government to publish statistics on the number of ESA decisions which have been overturned in claimants’favour through mandatory reconsiderations. 41. On 1 April 2013, the Legal Aid Sentencing and Punishment of Offenders Act(‘LASPO’) came into effect. 42. Clause 15 of Part 2 of Schedule 1 of this Act excludes all welfare benefit issues. 43. Welfare benefit cases no longer qualify for advice or assistance under the Legal Help scheme, not even for initial advice to identify justiciable issues under social security law, or to provide a triage role to steer cases away from tribunal and ensure that benefit claims are processed correctly. 44. The Government’s view is that as these are matters of ‘administrative justice’ issues in which decision making, adjudication and dispute resolution systems are accessible to claimants acting on their own, and that given the underlying issues are financial, they should be of minimal priority for public funding. 49. Although the government says that claimants can represent themselves, at a time when the UK’s social security system faces arguably the biggest upheaval since the introduction of the Welfare State, the Government should have recognised that the need for advice on welfare benefits has never been greater. 50. It should also have recognised the complexity of the benefit changes affecting disabled people. 51. Disabled people make up a disproportionate proportion of 58 per cent of those who receive legal aid for welfare benefits cases. 53. “the proposals have the potential to disproportionately affect female clients, BAME clients, and ill or disabled people, when compared with the population. This is as a result of those groups being overrepresented as users of civil legal aid services’. 54. The removal of Legal Aid for benefit claimants needs to be seen in the context of cuts to legal aid funding with £320m cut from the annual £2bn legal aid budget and the closures of 100 of Citizen Advice Bureau offices which used to support the most people with access to legal advice and representation. 55.According to the government’s own assessment, around 600,000 people will lose access to advice and legal representation, when CAB advisers estimate the success rate at ESA appeal where someone receives specialist CAB advice and is represented is around 80 per cent. 56. In October 2013, DWP has introduced changes to the appeals system; a claimant wishing to appeal a fit for work decision will no longer be able to submit their appeal to DWP, which would lodge the appeal with HMCTS (tribunals) on behalf of the claimant. 57. There will now be a first step known as Mandatory Reconsiderationwhich is an internal DWP process. 59. As admitted in the government response, there are no timescale for completion of the Mandatory Reconsideration process, as shown in the response to this Freedom of Information Request. 60. If someone’s claim has been disallowed completely, they will not receive payment pending Mandatory Reconsideration as was the case previously when somebody was allowed to appeal the same decision. DWP is suggesting that claimants should claim other benefits, such as Jobseeker’s Allowance, but there is evidence that some people are being refused JSA on the basis that they cannot, because of health issues fulfill all the conditions attached to this benefit. 62. There is absolutely no indication or evidence that the UK government has taken any steps whatsover to reduce the stress or anxiety inherent in the Work Capability Assessment for benefit claimants. 63. The WCA is inherently stressful for claimants, because of the uncertainty of such a notoriously unreliable system where there are frequent media reports of incorrect decisions. Claimants are forced to wait long durations trapped in a bureaucracy that shows no compassion, not knowing if they will be judged “fit for work” and required to seek work, whether or not their medical condition makes that possible. 64. Claimants are understandably fearful that their benefits will be stopped, at the end of a process that they have no control over. 65. This is particularly harmful to claimants with Mental Health Conditions, especially those in the class of anxiety disorders as described in DSM-IV . This graph was compiled by Dr David Webster, Honorary Senior Research Fellow, Urban Studies, University of Glasgow, based on the figures released by DWP.